Why Are Opposition Parties Projecting the Rafale Deal as the New Bofors? Four years on and the National Democratic Alliance (NDA) government has been sailing smooth, with nary a scam or a scandal, much to the chagrin of the Opposition parties that are in various stages of disarray consequent upon the poll debacles they suffered in state after state since 2014. Nor is there possibility of any dark cloud of corruption charges gathering against the government in the distant horizon. With barely a year left for the general elections to the Parliament, and the government surging ahead in popularity with the implementation of a slew of developmental projects aimed at the strengthening of the economy and the unearthing of black money, the Opposition parties have been growing more and more frustrated over the lack of opportunities to besmirch the image of the Bharatiya Janata Party (BJP) and its NDA allies. Congress, the principal Opposition party, is particularly smarting over the Bofors scam, dating back to the Rajiv Gandhi regime, which had, along with several other scams and scandals that reared their ugly heads during the UPA regime, clipped it’s wings. Desperate to pin the Narendra Modi government on the mat, it had to make do with the available resources for raising a ruckus about a scam. The Rafale deal is one of the straws that the Opposition parties have been clutching to keep afloat in the fast changing political scenario that is threatening to render them irrelevant post 2019 polls. 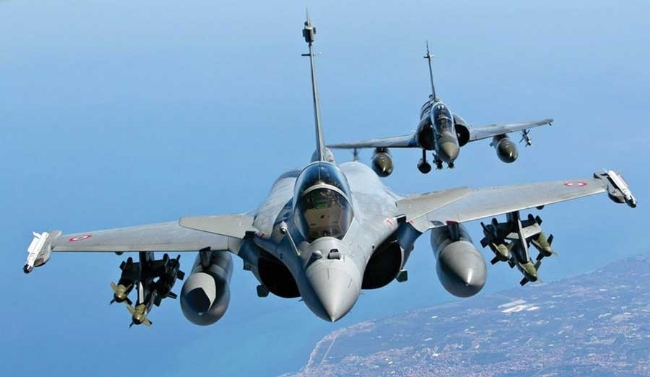 Earlier, the UPA government had decided to buy 18 Rafale fighter jets from France in a “fly-away condition” at a price yet to be decided; and Hindustan Aeronautics Limited (HAL) was to manufacture 108 jets with supply of technology by Dassault. The proposal was, however, scuppered by the NDA government when it assumed power in 2014 in favour of a new deal. During his visit to France in April 2015, Prime Minister Modi announced that India would buy 36 Rafale fighter jets on a government-to-government deal. The details of the purchase like the price were to be negotiated by the two governments. A Memorandum of Understanding (MoU) for the purchase was signed between the two countries in January 2016 during the visit of the French President François Hollande to India. The Opposition parties found in the Rafale deal an excellent opportunity to run down the NDA government albeit on spiteful grounds. The deal was, they alleged, against the Defence Procurement Procedure, since the two governments had arrived at the inter-governmental agreement in the Defence Minister’s absence. It was further alleged that the price of the 36 fighter aircrafts was finalised by the Modi government at a much higher rate than the cost of the 126 jets earlier negotiated by the UPA government. The Opposition parties also attributed the dropping of HAL in favour of Reliance Defence Ltd to the government’s purported support to crony capitalism. Here Congress and its allies were on the home ground on a familiar pitch, what with their constant refrain of charging the Modi government of favouring their “corporate cronies” at the cost of the nation’s interests. It was, therefore, no wonder that Congress President Rahul Gandhi made the accusation about the Rafale deal the key point of his address in the Parliament in July this year when his party supported a no-confidence motion moved by the Telugu Desam Party against the Modi government. In a high octane speech, marked by dramatics, Rahul squarely accused the Prime Minister of favouring his “corporate friends” who allegedly sponsored the PM’s “packaging and marketing”. The dropping of HAL out of the deal was, according to him, done with the ulterior motive of accommodating a private sector company. Rahul Gandhi also accused Defence Minister Nirmala Sitharaman of lying to the nation under pressure from the Prime Minister. He alleged that she had earlier told the House that she would be disclosing the unit cost of the fighter aircraft but by reneging on her word she did not keep her promise. Sitharaman claimed that the two contracting nations were bound to keep details of the contract, like the unit cost, out of the public domain, in keeping with an agreement on secrecy between the two nations. This was, according to the Congress President, an untruth. He went to the extent of claiming that the French President himself had told him that there was no agreement of secrecy between the two nations which prevented the disclosure of the price of the aircraft. He charged the Prime Minister and the Defence Minister of not disclosing the details of the deal with mala fide intentions. Much to the discomfiture of the Congress party and its President, the French government hastily issued a statement of rebuttal to Rahul Gandhi’s claim. As the details of the Rafale deal were of interest to competing companies in both the nations, the two sides were bound to keep the details away from the public domain. It said that a 2008 security agreement legally bound both India and France to “protect the classified information provided by the partner”. A breach of the agreement could impact security and operational capabilities of the defence equipment of the two nations. To sum it up, the French government termed the deal “very sensitive” and all the details could not, therefore, be disclosed. This caught Rahul Gandhi in a bind. However, he pushed the envelope further by brazenly claiming that he stood by his charge; he further claimed that Manmohan Singh and Anand Sharma were present during his meeting with the French President. What do you do when you are caught in the act of making an audacious claim that not only cannot be substantiated but is also proved baseless and hollow? Become more audacious, what else? That is exactly what Rahul Gandhi did, trying to put both the Indian and French governments in the dock. His charge of the Indian government spiking the aircraft’s price did not wash and was exposed for being part of a fake and malicious propaganda against the NDA government. The Defence Ministry, on its part, had stated earlier that disclosing the details of the Rafale deal might compromise India’s national security. Furthermore, giving an item-wise cost and other information would reveal details about weapons systems and jet customisation. The government’s stand in the matter was therefore clear and final. Notwithstanding the Defence Ministry’s clarification and the French Government’s confirmation, the Opposition’s dogged persistence on seeking the disclosure of the details of the deal is apparently a ploy to pressurise the government into making a faux pas. Even as the need for transparency is a very desirable requirement in the defence procurement deals in the interests of elimination of the scope for corruption and favouritism, security considerations and national interests have to be given overriding importance. Besides, abiding by Inter-Governmental Agreements like the one of 2008 is crucial for maintaining the Union government’s integrity by upholding its international commitments. The Congress Party, at the vanguard of the Opposition’s charge against the Modi-government, is pinning its hopes on drawing maximum mileage on the eve of the 2019 polls out of the Rafale deal based on the points of public perception regarding the alleged spiking of the prices and “corporate cronyism”. Even as it has not been able to grapple the BJP in a vice-like grip in the absence of incontrovertible proof or evidence, the political Opposition seems to have grabbed yet another opportunity to shoot itself in its foot, this time with the Bofors gun, no less! No sooner had it termed the Rafale deal as Narendra Modi’s Bofors, the Congress Party recalled that all these years it had maintained that Bofors was no scam. Hence, it was pointless to equate Rafale with Bofors! Bite your tongue as hard as you might, the Bofors gun has already backfired! Reliance was chosen as a offset partner by Dassault. The price of rafale jets as negotiated by BJP is less than what was negotiated earlier. Even France government has issued clarification on this subject. The people of India will not consider any decision by Modi government wrong or misguided. Take demonetisation which resulted in virtually no profits still people are not blaming their beloved PM. No other opposition party or politician has backed the Congress charge of corruption in the deal. This shows that Congress under Rahul Gandhi is treading a risky path with no evidences and just rhetoric. Not everyone in BJP is Modi so there is nothing wrong in investigating the rafale deal and coming up with a clear picture. Politicians whether from BJP or Congress should be held accountable. In the past even Congress has hidden pricing of defence deals with foreign partners from general public. In the parliament Congress said this is to protect integrity of armed forces. The deal is as clear as water and we must not forget that this is a government to government deal with national security interests underlying. Hence it is childish to blame Modi and BJP. Congress party knows that they will have to bring up corruption cases against the Modi regime if in 2019 elections the party wants a revival of fortunes. So Rahul will find problems in all projects and policies. When it is clear that Dassault was the L1 bidder in this tender and NDA struck a deal that is less costly as compared to UPA then how can Congress allege corruption in this deal? It is in the news that Reliance has business ties with a film production company based in France and the company is close to the then president who signed the deal with India. This must be investigated. Bofors was unprecedented and Rafale is not Bofors. There were clear evidencies of conflict of interest in Bofors however in Rafale the opposition is only building a case over lies.